No, I am not talking about drugs here, this is a family blog. The new Jointmaker SW is the little brother to the Jointmaker Pro. 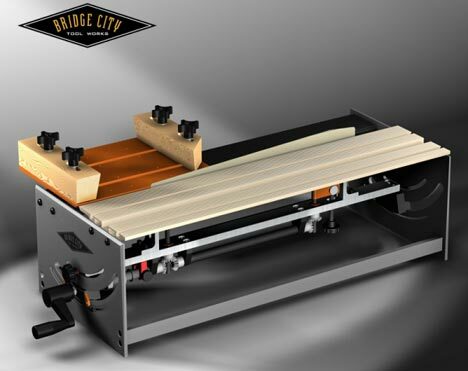 As odd as it may sound, the Jointmaker can best be described as a hand tool variation of the table saw. The SW in this latest Jointmaker version stands for single wing. So while you lose quite a bit over the Jointmaker Pro's double wing design, you also lose a bit in cost. This brings the price from $1300 down to $900. However, you also lose in the features department; the SW only bevels 45 in one direction and 15 in the other. The JM-SW (Single Wing) is big news. Rather than utilizing two sliding tables that are bridged (for most cuts), this saw functions similarly to most sliding table saws--there is one sliding table and one static table. The Jointmaker SW features the same linear bearing system as the JMP v2 on one side and is opposed by a static, extruded aluminum table.